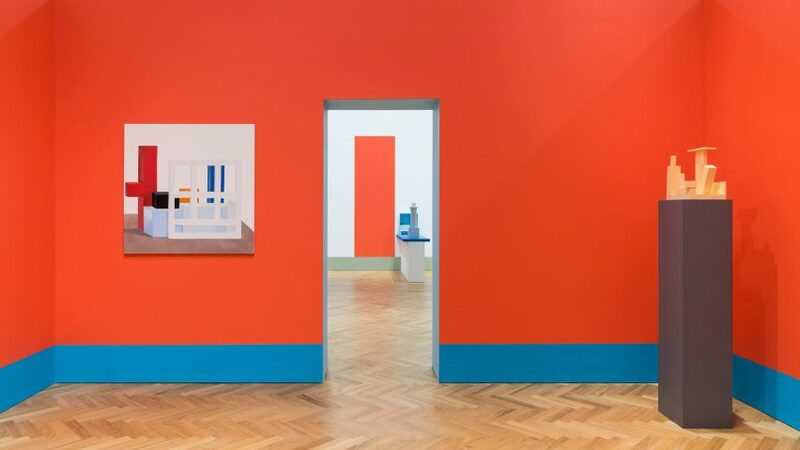 French designer and Memphis Group member Nathalie du Pasquier has created more than 50 new pieces for her first solo show in the UK in 25 years. The From Time to Time exhibition, which is being hosted by Pace London until 29 July, features sculpture, paintings and drawings, all with the bold geometric forms and colourful contrasts that Du Pasquier's work is known for. Her wooden sculptures resemble oversized chess pieces, and feature angular shapes reminiscent of buildings and other architectural elements. These are repeated in her still lifes. Some of the paintings include additional 3D elements, such as doors that fold out, or grid-like sections that extend beyond the edges of the piece. Du Pasquier has also painted graphic elements on the walls, which frame her works and echo their colours and forms. "Through the representation, I learned about looking and transforming what I saw into a painting," said Du Pasquier. "The abstract work is a different kind of position. I become a builder, an inventor." From Time to Time is arranged around a central red room, which is hung with some of the designer's more historic abstract paintings, often including shapes that reference domestic objects. Du Pasquier – who has described herself as a "painter who makes her own models" – often creates these as 3D pieces before painting them in flat colour on canvas. "The paintings in the red room are traditional still lifes representing abstract constructions, and you do not see them when you enter the exhibition," she said. "What you'll see, all around the space, is the recent work where I have composed abstract paintings, done in the last two years with three-dimensional elements that show the scars of time." "What I want to show in From Time to Time is this continuous shift from one position to another," she continued" It is in that movement that I recharge the dynamo." Du Pasquier, who is set for two more solo exhibitions later this year in London and Philadelphia, has seen a resurgence of interest in her work, along with that of the Memphis Group. The group was founded in 1982 by Ettore Sottsass. The designer, who is self-taught, has created jewellery, furniture and textiles, although shifted her focus to painting in the late 1980s. She launched a 43-piece collection with American Apparel in 2014 which featured her graphic prints and has also created textile designs for Wrong For Hay. Her intensely patterned Riviera carpet was also revealed to be part of David Bowie's own extensive Memphis collection when it went on sale through auction house Sotheby's last year. Postmodernism as a whole has undergone a revival, with its bright colours and bold forms being rediscovered and reinvented. Lee Broom recently unveiled a po-mo-inspired set of ceramics with monochrome stripes and colourful details, and Camille Walala applied her bold graphics to a collection of homeware for London's Aria design store.